Oh, I am so beyond ready for spring right now! I'm ready for bare legs and no coats, but it just seems like the snow and cold are never ending! Are you guys feeling the same? Well, spring has sprung here on the blog no matter what it feels like outside, so I have a little pink and green inspiration for you to kick off the weekend. It may seem weird for me to recommend another coat at this point, but this classic, military-inspired coat is majorly on sale at H&M. This would be a smart purchase to buy now and save for next winter (or if the weather stays at it has been, for now). This is a super easy piece to style, right? Just layer over your favorite white tee and style with just about anything else on the bottom like this, this, or even this. Do you all use color corrector? It's certainly not the most necessary step in your makeup routine, but it is a really good one. The Becca Backlight Targeted Colour Corrector in the shade Pistachio is perfect for neutralizing redness in the skin and evening out your skin tone. Plus, isn't the color so pretty? This Madewell dress is basically the epitome of classic spring dressing. You can't go wrong with a sweet, floral dress and I love that this one comes in such a soft, fresh color. You could pair this with espadrilles, a cute wrap sandal, or an ankle boot. If you're looking for a more affordable alternative to the Loewe puzzle bag, I highly recommend looking into Botkier's Cobble Hill bags. This one in blush pink caught my eye (of course), but I also love the yellow, seafoam, and poppy colorblock for this spring. We all know and love the Marc Fisher wedges by now, right? A wedge espadrille is a classic spring/summer essential and this blush pair add a little feminine touch to your look. Pair them with a pair of straight leg jeans and a black bodysuit or try something different by pairing them with an oversized shirt dress. 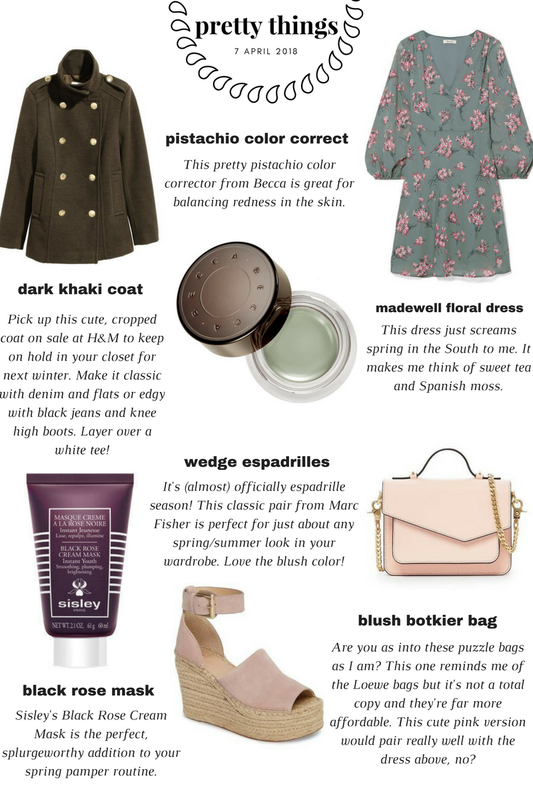 I absolutely loved Phoebe Tonkin's most recent ITG Top Shelf in which she mentioned this Sisley Black Rose Cream Mask. This mask comes highly recommended from so many people in the industry. If anything, read the Top Shelf for good vibes and inspiration.